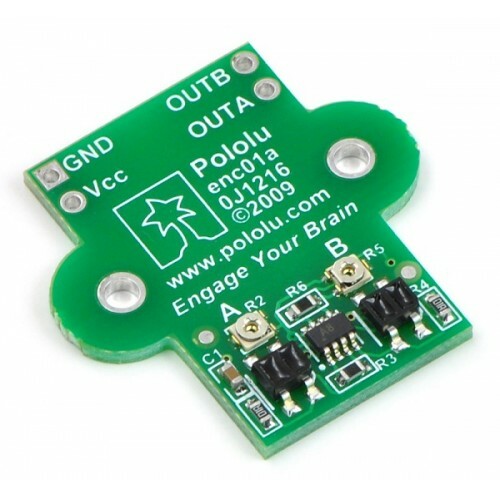 This quadrature encoder board is designed to work with Pololu micro metal gearmotors by holding two infrared reflectance sensors inside the hub of a Pololu 42×19mm wheel and measuring the movement of the twelve teeth along the wheel’s rim. The two sensors are spaced to provide waveforms approximately 90 degrees out of phase, allowing the direction of rotation to be determined and providing four counts per tooth for a resolution of 48 counts per wheel rotation. 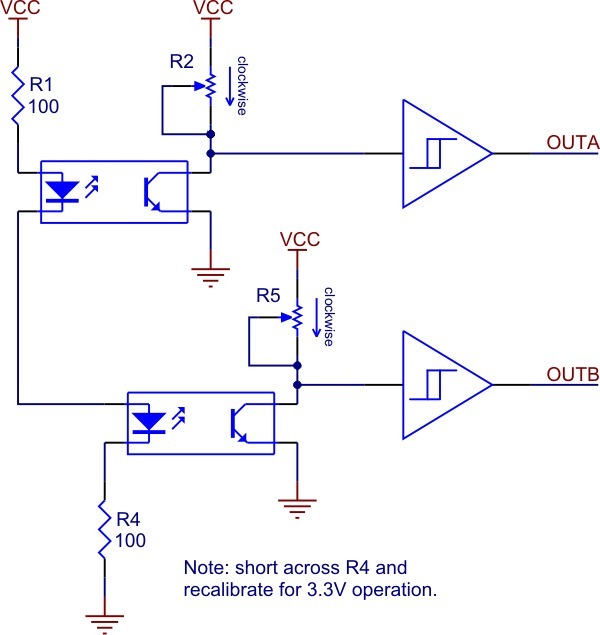 Each analog sensor signal is fed to a comparator with hysteresis to provide glitch-free digital outputs. The compact layout of the board fits all of the components within the envelope of the hub and tire, allowing the board to be mounted between the motor and a chassis. 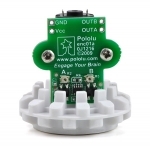 The encoder is calibrated for operation from 4.5 V to 5.5 V, but it can be recalibrated for operation at 3.3 V.
Note that this encoder will only work with the Pololu 42×19mm wheel. 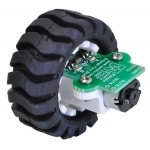 If you are looking for a higher-resolution quadrature encoder that works with micro metal gearmotors and arbitrary wheels, consider the magnetic encoder pair kit for micro metal gearmotors. The encoder is designed to fit within the outline of the extended micro gearmotor brackets that are in turn designed to work with the Pololu 42×19mm wheel and Pololu micro metal gearmotors, so most applications that can use that bracket should require little or no modifications, though it should be noted that the 1/16" thickness of the PCB will change the height of a chassis relative to the wheel. The power and output connections are brought out to the end of the PCB under the motor terminals so that wiring to all six terminals can be routed together. Wires can be soldered directly to the through-hole power and output pads, or some connectors with a 0.1" spacing, can also be used. 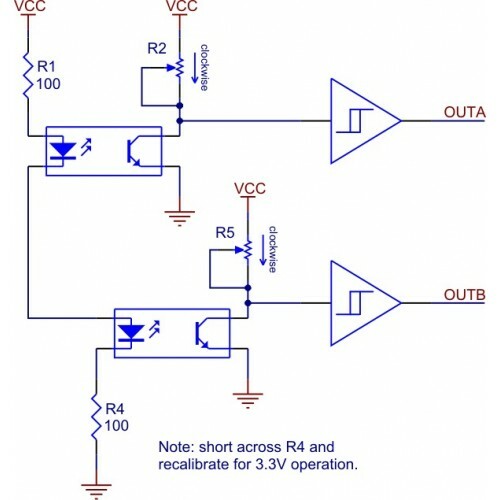 The two outputs of the encoder are digital outputs that can be connected directly to digital input pins on most microcontrollers (inputs that can generate interrupts on change are recommended). With 48 state changes per revolution of the 42 mm wheel, a speed of 1 m/s (a bit over 3 feet per second) generates approximately 360 state changes per second. With two encoders used simultaneously, as is the case for most differential-drive robots, the encoders will require attention almost every millisecond. 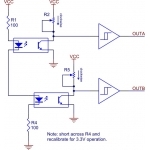 Decoding the encoder outputs should only take a few percent of the processing power of a high-performance microcontroller such as the Atmel AVR.